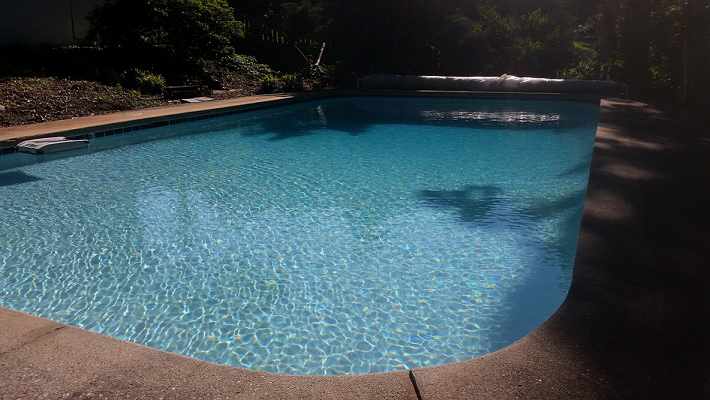 I know that if you keep your water balanced and stay on top of adding chemicals that you should not need to SLAM your pool (except for those that close down pool in winter). However, I'm assuming (maybe falsely) that despite everyone's best efforts there will always come a time that a pool doesn't pass the OCLT or your CC gets above 1. With that said, I was curious what the longest streak everyone has had where they have not needed to SLAM their pool? (Not counting the initial SLAM many do each year to open their pools). When you did finally have to SLAM your pool what do you attribute to as the reason? Did you get lazy in adding chemicals, did you go on vacation, did you just have an algae bloom despite keeping everything balanced, ect? Since I do not put a cover on my pool over the winter, opening it in the spring usually involves scooping out a small amount of debris. This debris leaves sediment at the bottom of my pool that once stirred up makes my clear water turn green. This leads to a very short SLAM once a year that only lasts for a couple days because most of that sediment just needs to be filtered out. I'm very diligent about testing my water and keeping it balanced to avoid any issues. I close late in the fall bringing it up to SLAM level and open up early in the spring to avoid neglecting my pool while the water temperature is still warm enough for algae to bloom. Who knows, maybe one of these years I will buy a cover for it and forgo the SLAM altogether? going on 3 years. have owned pools for 4.
to get levels low enough for it to work, then mustard algae formed. Keep in mind that where I live, and I assume where you live, it might get too cold to swim, but we never close our pools. I've never SLAMmed my own pool. Closest I've gotten is to raise the FC a little and add some DE when the sparkle goes away. If it doesn't look like this (yesterday) I'm not happy! Pool is 19 months old never slammed hope to never have to. Stenner pump probably gives me a false sense of security though, makes things a bit too easy, I was testing way more when manually adding chlorine. Been using TFP from day one (built in 2015) and no SLAM ever and hope I never do! We close pool in winter and follow TFP procedures and so far we haven't needed to SLAM at opening either. This year we actually had a little FC left when we opened! We went four years without slamming our Salt Water Pool. When I did SLAM, it was do to a circulation problem that was mechanical failure. Opened pool in 2014, never had to SLAM. Found it a touch cloudy last summer after much time away, but a few days of a few PPM max limit for my Cya got me straight. Just finished my 1st slam last week, then had to lower my FC to add stain remover (stains were there when I started the slam). As of today the stains ae gone and shave the chlorine back to 4.0. I think I'll keep the pool open year round this year just to see if I can maintain it even though I can't swim in it from about Mid Sep. to mid May. That way I won't have to buy a new cover. jagger2005 (and anyone else who might know) -- do you find that upon covering the pool, the FC levels stay stable (or close) over the intervening months until the cover comes off? 7 years. 365 days a year. It'll be 8 years come October. Pool was clear when I moved in and it has never had an algae bloom. Once time I did spy some algae lurking on the grout lines right at water level inside the skimmer throat, but I just scrubbed it off with a brush. I wanted to read these posts, since the following weekend my brother-in-law, who has had a pool for 20+ years, and I got in a conversation regarding chemical use for our pools. I told him about TFP and that all I add to my pool is bleach and a little muriatic acid when needed. He ask how often I SLAMMED. I told him once upon opening my pool (and in the 3 years since finding this site and converting from Baquacil this is the first year I've had to do it upon opening). He told me that bleach alone does not kill algae. I told him my pool was crystal clear and stayed much cleaner then most others I've seen. He would not budge from his opinion that my pool should be SLAMMED regularly. He uses the tablets and shocks once a week. I ask him why he needed to shock the pool if the tablets did their job. His response, because you're suppose too!! I had to agree with him that putting tablets in two or three times a week and sticking a strip in the pool to test would be much quicker and easier, especially when you're away from home even just a few days! BUT I love my nice clear pool and knowing what is in my pool water. The ONLY reason I would consider changing what I do is for the ease of leaving home for any period of time, without worrying what's going to happen to my pool!! I have to have my neighbor put bleach in for me every day if we are gone! My question is why does he think algae would be growing in my pool if I only add bleach and never "shock it". My sister thinks my pool is not safe to swim in because of this. BUT it is crystal clear!! It actually sparkles! I can't say the same for theirs! Also, any suggestions for when you're leaving for an extended period of time on how to keep the chlorine level up?? Many bleaches have strong bactericidal properties, and are used for disinfecting and sterilizing and thus are used in swimming pool sanitation to control bacteria, viruses and algae and in any institution where sterile conditions are needed. When I am on vacation I use a floater with trichlor pucks. My CYA runs low as it is, and 5 days worth of trichlor isn't going to raise it that much in that time-frame. Any longer than say 5 days I get whoever is feeding the cats to blindly (no testing) add chlorine with the pump running and hope for the best. No troubles yet! I thought a cover would keep pretty much all rain out? Or is your pool not covered continuously during the off-season? Newbie here, so I am sure I'm missing something obvious. Thank you! Wikipedia it is! !